LESS PREP TIME, MORE DRINK TIME:This collection includes the main things you need to get the job done in a fraction of the time. 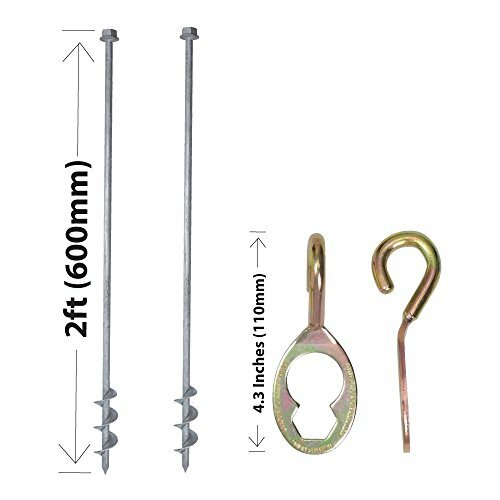 Our kits come with 1ft, spiral spikes that can either be drilled or manually screwed into most turf, using our patent-designed hexhook. Whichever method you choose, our steel tent pegs take far less time & effort to anchor than our competitors, which means you can use that saved time to enjoy a cold beer. As a bonus, our unique hexhooks double as bottle openers. THE COMPLETE PACKAGE: With the GroundGrabba Pro II Pack 2 pack, you receive 2, heat-treated , galvanized carbon steel stakes with spiral flights, each topped with a ¾" built-in hex head. You also receive 2 hexhooks that serve to help manually install the pegs , as well as hook on to whatever object you're tieing down. Why not option-up and add on a hex driver, masonry drill bit or storage bag? Then all you really need to bring is a drill, some cold brews, and a positive attitude. OUR "100% SATISFACTION" PROMISE: We are so sure in the quality of the GroundGrabba Pro Pack 1, we know you'll not only love it but also get plenty of use out of it. Not a fan? Return it within 30 days upon purchase for a full refund. These ground stakes are so well-made, we offer a lifetime warranty. Should anything happen to a part, we'll replace it immediately. STAKE YOUR CLAIM: It doesn't matter if you are tying down patio furniture , putting up signs around your business, setting up vendor tents for a party or event, or need reliable metal stakes to ground your camping tent - there is a primitive need in every man to keep his stuff protected and secure. With our metal ground pegs, you can feel confident that whatever you are anchoring will remain intact and safe, regardless of weather conditions. This is YOUR stuff and nothings going to mess with it. If you have any questions about this product by GG GROUND GRABBA, contact us by completing and submitting the form below. If you are looking for a specif part number, please include it with your message.